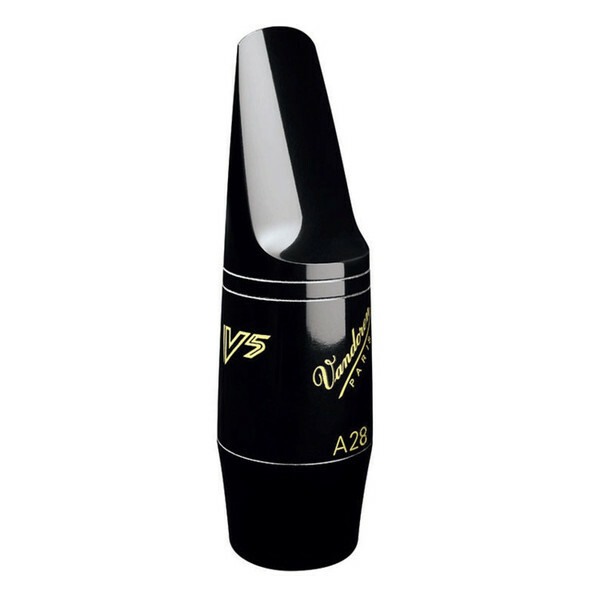 The A28 is the standard V5 Alto Saxophone mouthpiece, and certainly one of the more popular. It offers a rich sound and tonal colour as well as a brilliant and attractive edge particularly in its vast dynamic range. Suited for weaker reeds, this is a good mouthpiece for intermediate players. These mouthpieces features a smaller than normal bore and a flat baffle, very much like a traditional mouthpiece from the saxophone?s creation. This gives a tone that is very infrequently too harsh or shrill but rather gives a pleasant and rich tone. The medium sized chamber gives a full and rounded tone but also offers a core of sound which gives the saxophone its expressivity. This small bore mouthpiece offers accurate intonation and a clear articulation across all the range. Because of the small bore, the resistance makes the instrument easy to play without using a huge amount of air. This means that slightly more effortless playing can achieve a wonderful timbre and a superb richness of sound.